An interwoven combination of research and artwork, I encourage public participation that seeks to enable an individual questioning of the values by which we live. Generally situated outside the gallery, the conversations generated by ‘art/non art’ installations are the vital element. Transition Town Totnes, is the UK’s first town exploring how to prepare for a carbon constrained, energy lean world. The aim, through an energy descent plan (2008) for Totnes, is that a town using much less energy and resources could, if properly planned for and designed, be more resilient, abundant and pleasurable than the present.. 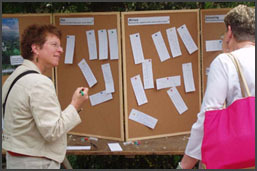 Through a process of talks, film screenings and open space events, a number of different groups have been established to envision various aspects of Totnes’ community in the future. These include Food, Energy, Medicine, Transport, Housing, Local Government, Heart and Soul (ecopsychology), and The Arts. I am facilitating The TTT Arts Group. We conceive that within TTT, the arts can have an extensive role to play, in allowing temporary spaces, time and practical projects to explore, engage, experience, enthuse and empower. This arts initiative, established November 2006, has already attracted significant interest from all arts sectors. Projects initiated are: TTT@ Totnes Festival: Local arts, music, theatre, food and drink and alternative energy; The Big Bag Project: to replace plastic carrier bags in Totnes, a campaign, artists designs, new local industry; Eco-films with comedy; Sustainable-makers: sourcing supplies, local energy, sustainable distribution; Umbrella: portable, responsive collective arts exhibition and performance space. 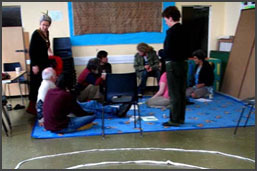 Conversations: Investigating the ‘value-action gap’ through socially engaged art practice. My PhD practice based research explores the ethical and social responsibilities of a socially engaged practice when it seeks to engender environmental behaviour change. research. I am using my art practice to probe the ‘value-action gap’, to involve participants in consideration of its consequences and how it might be overcome. In undertaking this as research I seek to address the issues of ephemerality in socially engaged practice and through research methodologies make a thorough record of the artworks as they occur (Kester 2004:189). Two projects, Conscience Offsets and Eco-renovation: House Receipts have already identified conversation generated by ‘art/non art’ installations, as a vital though unrecorded element (Kester; Lacy). Provocation, execution and documentation of a variety of modes of conversation are consequently identified as the main methods in a series of planed projects through which the research will be conducted. Project examples will include: collective conversation exploring the paradox of and approaches to ‘the value-action gap’ between a sociologist, eco-psychologist and community artist; Is there a place to which you belong? Re-presented one to one conversations, both visual and textual exploring the link between values and belonging; Eco-DIY an web/listserv conversation probing the values of consumption and environmental change. I also consider the possible impact that challenge might have on participants of my artwork. I therefore wrote a comprehensive ethical statement, drawn from sociology, anthropology and art practice, which will provide a framework within which the research and art practice will be conducted and through which all participants will knowingly be involved in and contribute to projects. The tensions of working within an ethical statement will be reported.